The Heron Building – part of London’s Milton Court development – is emerging to take its place as one of the capital’s most iconic and impressive landmarks. Its 36 floors will ultimately house 285 high quality apartments alongside other facilities – not least a theatre and concert hall for the Guildhall School of Music and Drama. Just as the design impresses, the method of construction has presented a number of key challenges, all of which are being successfully addressed by main contractor Sir Robert McAlpine Limited. This has included the question of material and personnel movement, with the need to move some 300 construction workers and a vast range of construction materials repeatedly each day, to an eventual height of 115 metres above ground level. 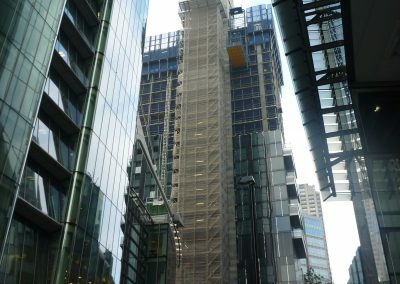 The solution has been to construct what is understood to be the highest freestanding scaffold in the UK. 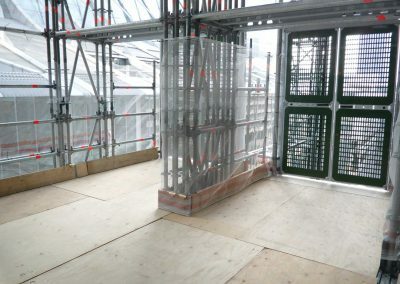 Built using the Layher Allround® scaffolding system, a hoist tower has been erected by scaffolding contractor Connect Scaffolding to provide anchoring points for the double passenger and goods hoists mechanism and to create access to each floor. 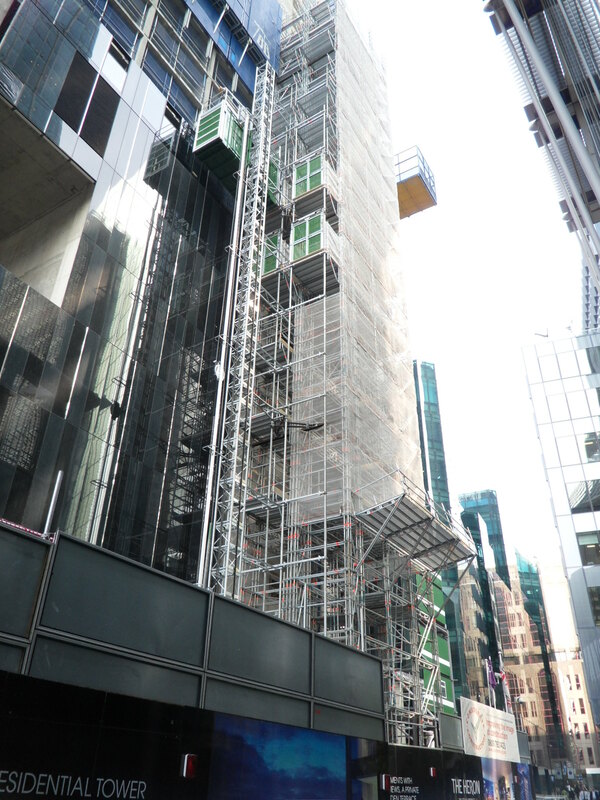 “We were delighted that Sir Robert McAlpine selected our Allround® scaffolding system for the access and hoist tower construction, with the leg loading to height equation for a building of this height a key factor,” says Layher UK’s MD Sean Pike. 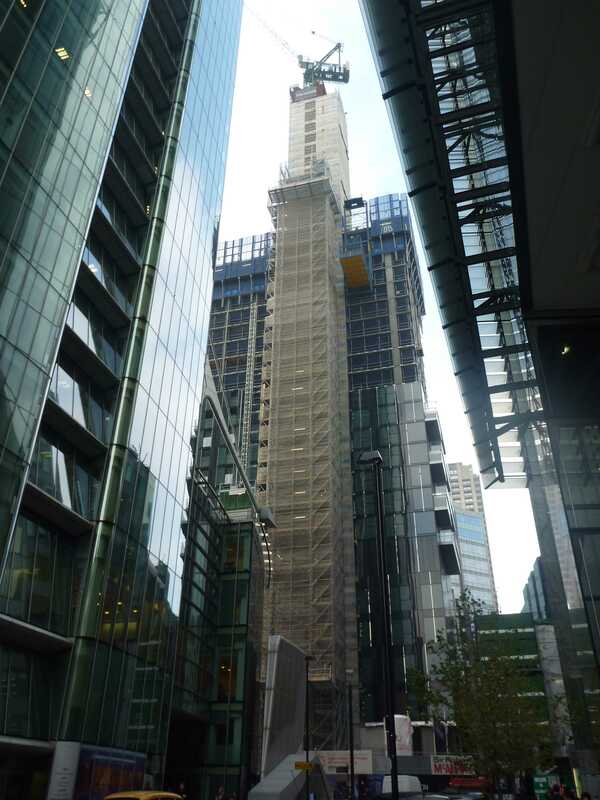 The scaffold structure sees conventional Layher ties fixed to the concrete core at each level, with the hoist tower itself tied to the scaffolding at 12 metre intervals, with the Layher decking system used also adding structural strength. 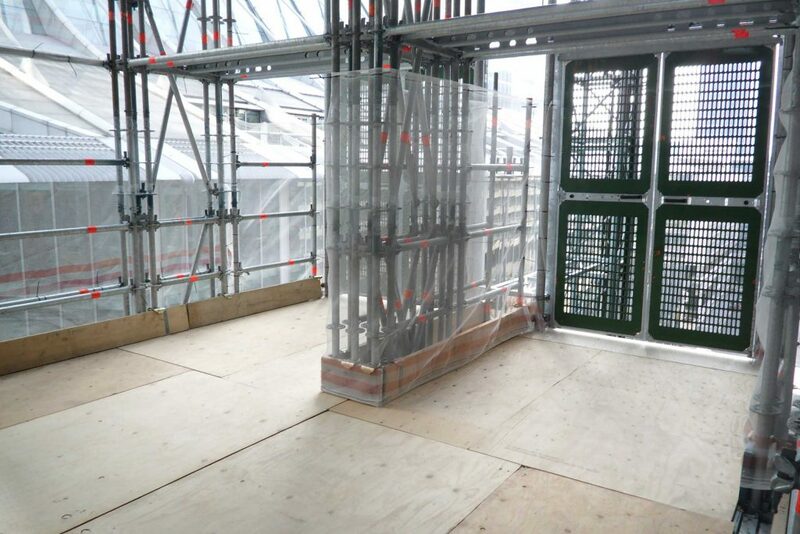 The highly versatile Allround® system, with its wide bay design, offers clear access between the support scaffold and both the passenger and goods hoist platforms and building itself. 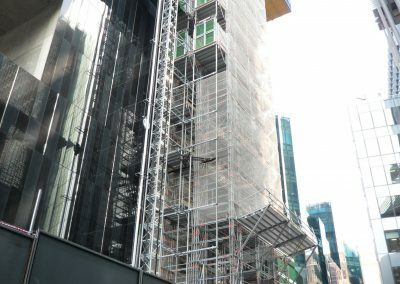 “Sir Robert McAlpine also developed an innovative ‘Steel Tie Beam’, which helps to integrate the hoist system with the Allround® tower,” adds Connect Scaffolding’s MD, Oliver Cave.